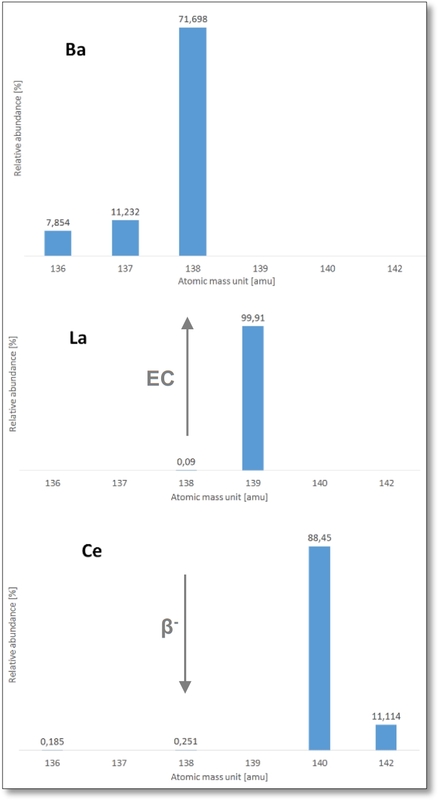 Figure 1: Relative abundances [%] of the isotopes Ba, La and Ce. 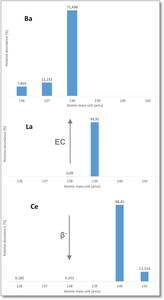 The arrows show the decay from 138La to 138Ce through ?--decay and 138Ba through electron capture. During my GSGS start-up honours grant, which I received from 10/2014 to 4/2015, I was able to work on my PhD project. In this project I want to unravel information about the timing of geological processes and about the interaction of geological reservoirs on Earth complementing information from the more popular 147Sm-143Nd and 176Lu-176Hf systems. The method is based on the decay of 138La to 138Ce through ?--decay and 138Ba through electron capture (Fig.1). Cerium isotope measurements are analytically challenging: first, there are strong isobaric interferences from 138Ba on 138Ce and from 142Nd on 142Ce; second, static measurements of all Ce isotopes are difficult due to the high abundance of 140Ce (88.45%) relative to the small abundances of 136Ce (0.185%) and radiogenic 138Ce (0.251%). In these 6 months I prepared a new reference material (“Ce-AMES Cologne”) from Ames Laboratory Ce-metal, because the JMC 304 standard, which is used in older studies, is not commercially available anymore. Relative to JMC 304, an ?138Ce value of +0.67 ±10 ppm (2? r.s.e.) was determined for Ce-AMES Cologne. The analytical technique to separate Ce from matrix elements and in particular from interfering Ba, La and Nd was improved. In a first test, the method was applied on different standard basalts and the simultaneous measurement of all Ce isotopes was performed by Multicollector - inductively coupled plasma - mass spectrometry (MC-ICP-MS). Assuming an ?138Ce (CHUR) of +1.46 ppm for JMC 304 [1,2], our measured ?138Ce (CHUR) for BCR-2 and BHVO-2 are -0.14±30 ppm and -1,44±30 ppm, respectively. These results are in good agreement with those of older TIMS studies [1,2], and the relative difference between the standard basalts is also in good agreement with a more recent TIMS study . However, there are systematic differences relative to the AMES standard values used in our study and in [3,4], calling for a better characterization of standard materials used in different laboratories. I would like to thank the GSGS and the steering committee for funding my research. In the meantime, the research proposal was accepted by the European Research Council (ERC) and I can continue my PhD thesis.